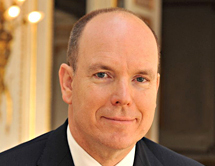 Prince Albert II is a fourth generation ocean champion, who has followed in the footsteps of his great-grandfather Prince Albert I and his father Prince Rainier III—both strong proponents of environmental protection. He is an intrepid voyager who frequently takes part in marine scientific expeditions to directly observe the ocean’s most pressing threats—notably he is the only Head of State ever to travel to both poles. Prince Albert II was among the first to bring focus to the alarming state of Mediterranean blue-fin tuna stocks due to uncontrolled overfishing. He has sounded a loud warning about the threats posed by ocean acidification, including the destruction of coral reefs and marine food webs, which will threaten protein supplies and food security for millions. Widely respected for his ocean conservation commitment, Prince Albert II led the preparation of the "oceans" component of the Rio +20 conference. His Foundation is dedicated to the protection of the environment and the promotion of sustainable development on a global scale across three geographical zones: the Mediterranean basin (home of the Principality of Monaco), the Polar regions, and the least developed countries, which are severely impacted by the effects of climate change and the loss of marine biodiversity.